Get ready for happy shopping season in New York and New Jersey! 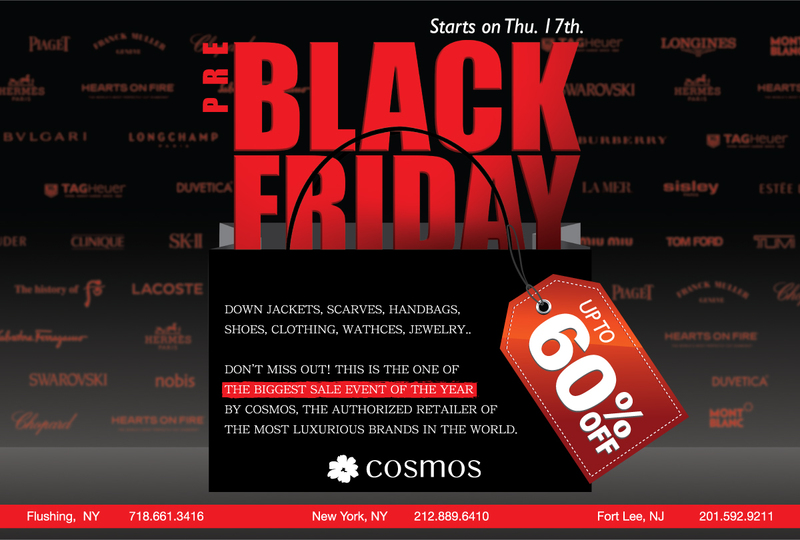 COSMOS PRE-Black Friday SALE, the biggest sale event for holiday shopper, is kicked off up to 60% off on all items at Cosmos Manhattan, Flushing and Fort Lee! Don’t miss out this great deal. Check your nearest COSMOS store. Sale Item: Storewide sale including Down Jacket, Scarves, Handbags, Shoes, Clothing, Watches, Jewelry, Sunglasses, etc. 블랙프라이데이를 앞두고 코스모스 3개 지점에서 동시에 진행하는 파격 세일 UP TO 60% OFF! 오늘부터 플러싱점과 뉴저지 포트리점의 세일이 시작되었으니 이번 블랙프라이데이 세일, 놓치지 마세요!